Where has the time gone? Most of us find ourselves saying that now and again, especially as we watch our children grow. That is the running theme in my head like a song that is stuck playing over and over again. Tears almost trickle down, but yet I am happy. Everything is good. Really good. But yesterday was preschool, I am sure of it—when he was pushing his new sister in her stroller shouting to everyone to come see her. He did this for a year, exclaiming, “This is Zoie…she’s my new baby sister!” New is a relative word it seemed. Who knew he had it all together right from the get go? Family is IT and hopefully, with a little luck, he has taken that early bit of knowledge to heart even though the crazy teen years are upon him. One of the most important things I have tried to teach my kids is that we stick by each other through absolutely everything. It’s not always going to be smooth sailing, and sometimes the rough patches seem to outweigh the blue skies, but if we can at least face it together that is something….actually that is everything. As parents, we are their true rock or lighthouse in a storm. We can choose to let them know that we will help see them through anything and love them for exactly who they are even if it’s not who we imagined they would be. Alternately, we can teach them that our love is conditional…if they score a goal, if they get straight A’s, if they are popular…that somehow we love them more fore these things. Scary, isn’t it? How easy it is to teach them that our love is conditional. Of course, we all fall prey to that. Where is the balance between helping to boost their self-esteem when they succeed and yet letting them know that they can’t always be the best, but that it is OK? Although some questions seem to have no answers, I do believe there is one true parenting rule that holds fast…just love them through it all, the bad, the good and the ugly. And anyone with a teen can tell you, there will be days that are UGLY. I believe if they know that you will ALWAYS be there without fail, even when they have let you down that somehow they will make it through. It turns out The Three Musketeers may have a message for us that still rings true…All for One and One for All. I think my son’s favorite candy bar is quite apropos tonight as I sit here contemplating parenthood and the last seventeen crazy years. As my extended family (all 11 of us) sat around the dining table, I thought how lucky we all are to have each other. There have been great times and almost unbearable times, but yet we have stood by each other and will continue to—All for One and One for All. —By the way, I decided to turn the cake into cupcakes so I could place pieces of the actual candy bar within each cupcake for a delicious surprise. My son said the cupcakes were awesome! He couldn’t believe how much they tasted like a Three Musketeers Bar. Both the light and airy, creamy frosting and the rich moist cake are melt-in-your mouth delicious so go ahead and make these. I will even put a 100% money back guarantee on these recipes! 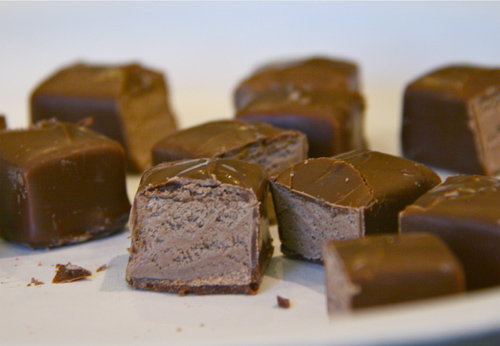 Chop 12 mini candy bars in thirds. Pour batter into prepared liners, 1/2 full. 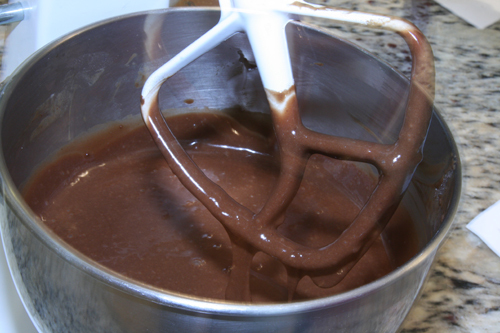 Place one of the 1/3 pieces of the candy bars in the batter, pushing down just slightly. Do not submerge the candybar in the batter completely. If you do, the bar sticks to the bottom of the liner and it tastes great but it does not allow the cupcake to come out of the liner entirely. If you just gently press down on the bar and then put a small spoonful of batter over the top so that the cupcake liner is about 2/3 full, that will make sure to cover the bar, but allow it to float in the batter instead of sink to the bottom. Bake for 20 minutes or until the cake is spongy to the touch. It should bounce back when touched lightly and look firm. A toothpick test will not work here since there is a candy bar in the middle and it will always look gooey when you put the toothpick in. Cool completely before frosting. To prepare the frosting, place 1/2 lb. of butter, the cocoa and salt in the bowl of an electric mixer fitted with a paddle attachment. Cream the mixture on low until thoroughly combined, about 3 minutes. Add the confectioners’ sugar, cream and vanilla. Combine on low for 10 seconds, then increase to medium and beat for 10 more seconds. Increase to high and beat until the icing is light and fluffy, about 3 minutes. Scrape down the sides of the bowl and beat for an additional minute. Remove from mixer and keep at room temperature until needed. Frost the cupcakes generously and use the left over pieces of the candy bars to garnish atop. Enjoy! mmm…rich and decadent! Love Musketeers bars atop. What great things to remind us to keep in mind – thanks, Geni. And I’m trying my best to enjoy my guys while they’re little, because it already seems like it’s going by so fast. Your son is one lucky guy – he gets these cupcakes and you as a mom! Geni, you are the Queen of Baking! You always have the most tempting treats!! And I so hear you on raising kids, my son is the baby… at 19. It’s so hard to think of him no longer my little guy and I’ve had to come to terms that he and his sister are so different and what I thought they would do, is not necessarily what they are doing. But I love them for who they are and they both have turned out good..in their own way! The cupcakes look amazing. I tried my first ever Three Musketeers bar this afternoon. I don’t think you can even find them here, so where it came from I have no idea. Regardless, they’re yummy. I’ll bet you had the same sort of “you’re seventeen? That’s impossible: *I’m* seventeen!” moment when your son’s age dawned on you as I got when I finally realized on standing in front of my freshman college students one fall that I really *was* old enough to be their mother–and better yet, the year when I realized if I stayed another year teaching I’d have my first students’ *children* in my classes. The good things about this? One: differences begin to matter less, and we mature enough to see that unconditional love can smooth over a whole lot of shocks indeed. 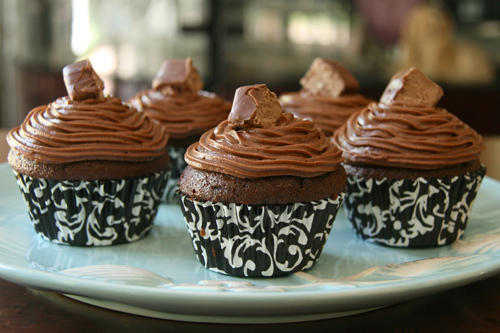 Two: we learn of the palliative powers of a delicious cupcake loaded with chocolatey goodness! And a significant bit of knowledge it is! Love this post!! Can’t believe he is 17! Time sure has flown!!!! Your post brought tears to my eyes. What I really want the cupcakes! A wonderful post, Geni, beautifully written. It should be typed and handed to new parents everywhere. It wouldn’t be a bad idea to include a couple of these cupcake, either. Awesome post. My oldest is 10 and it feels like she should still be a toddler! These cupcakes look amazing. Such a lovely blog post today… my children are 18 and 20 this past October. It is a bit like waking up and suddenly seeing them all grown up, isn’t it! This was a very touching retelling… and a beautiful recipe to boot! Lovely post Geni, Happy Birthday to your son and great cupcakes. Your son is smart. You know why? He went for chocolate for his birthday.. and so will I. I’m seriously thinking about making these cupcakes on my birthday. I think one of my parents’ main goals in raising me and my two siblings was to enforce the idea that when it came down to it, the three of us would always have each other. we would always be there for each other and together, we could get through anything. We are super close now, so I think it worked! I love that you are also teaching your kids this! And baking them such delicious birthday treats. 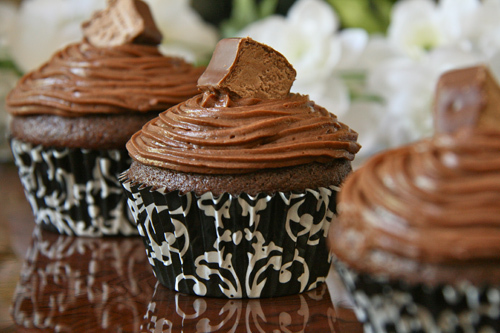 Three Musketeers were my favorite chocolate bar growing up…I think they must be even better in cupcake form! Great post, Geni! Happy Birthday to your son 🙂 He’s a lucky kid to have a mom like you making treats like these for him! Wow Geni, those are things I sit and contemplate on a daily basis. The toughest job in the world is parenting. Love those amazing cupcakes & I have not heard of Three Musketeer Bars. Got to get my hands on them. Happy birthday to your son! Such a lovely post about the importance of unconditional love and supporting our family. The cupcakes look great too! What a lovely post. And the cupcakes look delicious! This was a beautiful post, Geni. My parents did a wonderful job making me feel special even when I didn’t do as well as was hoped. I imagine that your children are extremely lucky to have you as a parent as well. Particularly since you can make such rockin’ cupcakes! DROOL. Geni, what a truly beautiful post and glorious cupcakes!! I love your writings and your recipes – you inspire me every time I read your posts. And you tied the theme of the Three Musketeers into your family so very, very well. Yes, “love them through the good, the bad, and the ugly”. Raising our children is by far the most important thing we will ever do. I’m writing this as I struggle with taking our 17 daughter to Walmart at midnight so she can purchase the new Harry Potter DVD. She said she would go herself, but her father and I don’t think a 17 year old girl needs to be going to Walmart alone at 12 o’clock at night or anywhere at that time for that matter. I offered to take her and because she’s mad she can’t go herself, she said she would just wait. Ah, sometimes it’s not so easy being a parent, but I wouldn’t trade it for anything. Happy Birthday to that wonderful 17 year old boy!! I already want to the time as a parent to slow down, and I’m only a mere 4 months in!! And Oh Dear Gussie, I love me a 3 Musketeer bar. I feel like it might be big trouble for my waistline to have these cupcakes in my house. They wouldn’t stand a chance!! Thank you for a wonderful post Geni! Parenting is never easy and the idea of not falling prey to conditional love is one I struggle with a lot. How do I encourage them to excell without making them feel they need to “earn” my love. Aww, wow! These muffins look amazing! You’ve done a great job, I must say! I love this recipe! I use it ALL the time and I use it for my basic chocolate cupcakes. I have been having a problem… lately, my cupcakes rise and look pretty in the oven and then when I take them out, they sink. I know that they are baked enough because the tooth pick comes out clean. Do you have any idea what is going on?? I am confused. Thank you!! !